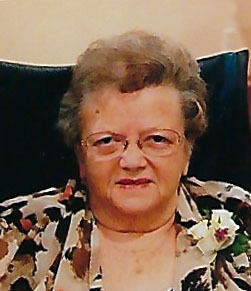 Ida Mae Wittman “Tootie”, 81, passed away peacefully in her sleep, with her family by her side, on Sunday February 10, 2019 at Grand Horizons Assisted Living. She was born in Appleton on February 25, 1937, daughter of the late Earl and Evelyn (Mentzel) Spaulding. Ida married Richard Wittman on November 19, 1959 at St. Edwards Catholic Church, Mackville where they were members. Richard preceded Ida in death on October 11, 2002. Ida enjoyed her monthly Sheepshead parties and attending music shows of “Jerry Voelker and the Jolly Gents”. She also enjoyed visiting Germany with the band. Ida will be deeply missed by her six children: Debbie (Don) Smith, Michael Wittman, Steve (Shelley) Wittman, Dennis (Rhonda) Wittman, Sandra Wittman and Sherry Wittman (special friend Tom Frieders); 10 grandchildren: Windy (Binesh) Kathal, Kennith Smith, Brent (Monica) Wittman, Angela (Kevin) Oudenhoven, David (Jen) Wittman, Jeffrey Belonger, Kyle (Kelsey Theyel) Belonger, Jason Belonger, Krissy (Ben) Vosters and Kim Taylor; 12 great grandchildren: Amelia, Ethan and Wyatt Kathal, Shoryu and Lennox Smith, Damian Martinez, Eli Wittman, Adrianna, Isabella, Dominick Wittman, Olivia Oudenhoven and Wesley Vosters. Ida was further preceded in death by two granddaughters: Alicia Wittman and Stephanie Wittman; her three brothers: Lester (Sonny), Ronald, and Russ Spaulding; two sisters: Audrey Steffens and Sally Johnson; sister in-law, Loretta (William) Arnold; and brother in-law, Clarence (Helen) Wittman. Mass of Christian burial for Ida will be 1:00 PM on Friday February 15, 2019 at ST. EDWARD CATHOLIC CHURCH, N2926 State Hwy 47, Mackville, with Fr. Walter Stumpf officiating. Visitation will be held at the church Friday beginning at 10:00 AM until 12:45 PM; with Mass to begin at 1:00 PM. Ida will be laid to rest in the St. Edward Catholic Cemetery next to Richard. Ida’s family would like to extend a special thank you to the entire staff of both Grand Horizons and Compassus Hospice, and a very special thank you to Tootie W. for coming in and praying with Ida and being there for her family, “you are a very thoughtful person and go beyond your job to help the residents and their families”. “May you rest in peace dear mother, we will remember you always, you were our rock, love you always”.